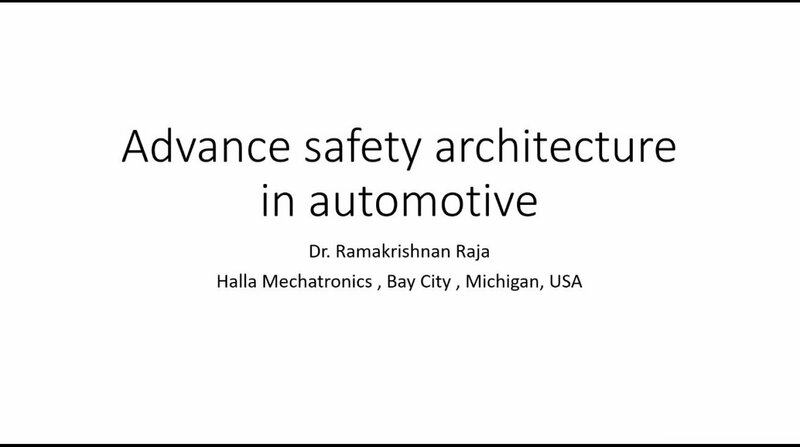 Abstract- This presentation gives a review of various advanced system architecture deployed by the safety critical components such as brakes and steering. The presentation talks about various type of redundant architectures deployed for autonomous driving conditions. It also discusses about advantages and disadvantages of such architectural changes. An overview of advance controls strategy for Steer By Wire, Brake by Wire will be discussed in this presentation. Ramakrishnan Raja (M 11) received B.Sc. degree from Amrita Institute of technology, India in 2003 and Masters Degree in electrical engineering from New Jersey Institute of Technology, in 2005. He received his Ph.D. degree in automotive system engineering from University of Michigan-Dearborn, MI. From 2004-2013 he has been working for Delphi steering and Nexteer automotive as Senior Electrical Engineer. Currently he is working at Halla mechatronics as Chief Scientist-Controls. He is responsible for motor drive control for various automotive applications. His research interest includes electrical machines and variable speed drives including sensorless motor control drives.